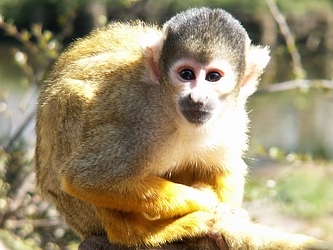 The Spider Monkey is found in the southern portions of <?xml:namespace prefix = st1 ns = "urn:schemas-microsoft-com:office:smarttags" />Mexico down to Bolivia and Brazil’s Matto Grosso. It is from 15 to 25 inches in head and body length, with long limbs and a muscular tail of 20 to 36 inches. Spider Monkeys use body language, gestures, and stances to communicate their intentions even when mating. The stances and gestures that we use are very similar to that of a spider monkey when trying to catch ones attention. The bigger the threat to the monkeys the louder the warning call, if a tiger or leopard approaches they will bark at the direction of the threat, to warn the others of its location. If it was a small threat such as another monkey they would climb to the end of the branch and shake the leaves to warn it away, if there is more than one they will bark too. If the bigger threat grows closer to the monkey they will defend themselves by breaking off branches and throwing them at the intruder. Spider monkeys have many physical features. Some of the physical features are: the tail, the limbs, and fur. A spider monkey's tail can be up to 35 inches long (89cm). Spider monkeys have highly flexible hairless tips complete with skin grooves like fingerprints. If spider monkeys didn't have the physical features then they woukd face a lot of problems like it would be a lot harder to climb trees. They would have to walk or crawl to get around. Some animals that have the same physical features are the: tail, the limbs, and the eyes.